With stress affecting his quality of sleep, Tim Antos attended a clinic and discovered the effectiveness of audio to help him fall asleep. Unfortunately, he found normal headphones were either too bulky and uncomfortable or would dislodge in the night. After a year of research, he developed what is thought to be the “world’s first” sleep-sensing, smart headphones – designed to mould to the contours of the user’s head as well as tracking and measure your sleep to identify bad habits. Kokoon’s mobile app provides a limited range of free audio content, as well as a monthly subscription service unlocking unlimited content. Following a stint at the world’s leading hardware accelerator, HAX, based in Shenzhen, China in 2015 the company launched a Kickstarter campaign with a target of $100,000. Going on to raise 19 times that amount, Kokoon pre-sold 10,000 units to stressed and sleep deprived adults and frequent travellers thanks to the exposure it gained from the campaign. 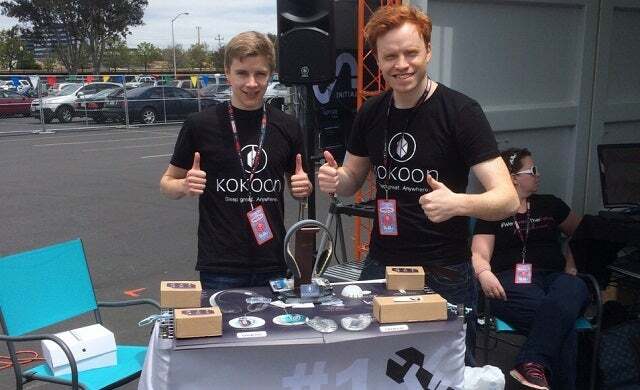 Currently still at pre-launch stage but now with 12 full-time employees, the next year will see Kokoon fulfil its first headphone shipments and then commence on an aggressive marketing strategy. Having just been accepted in the latest cohort of Breed Reply – the advanced Internet of Things accelerator – the duo have plans to increase the business’ market share and hit the ambitious target of selling 4,600 units a month. Also in the pipeline are plans to explore other uses for the headphones, several new hires and a Series A funding round.